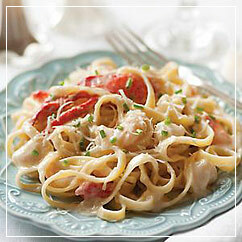 This seafood Alfredo recipe is easy, simple and relatively inexpensive. It takes as long to cook as the pasta takes to boil! I love seafood. I like it any way I can get it and I created this easy seafood pasta dish that you can use for a light meal, or as a side dish or an appetizer. Parsley flakes or Italian seasoning for garnish. This dish is so quick, you should first start boiling water with salt (or oil) for the pasta. When the water boils, add a handful of pasta, and cook until your desired texture. While this is happening, proceed to cook the sauce as instructed below. Now, in most of my pasta dishes I like using minced garlic and onions as a base. The first thing to do is clarify the garlic and onions in olive oil, sprinkled with a little bit of Old Bay Seasoning in a 10 - 12 inch frying pan. Reduce the heat to medium and then add the seafood and cook until it is pink. I like mushrooms in mine, and sometimes spinach. But if you add mushrooms and spinach, make sure the onions and garlic are clarified first, and the seafood has already been cooked. Add the Alfredo sauce. This recipe will make it thick and rich with seafood content. If you prefer more sauce, then add more sauce or milk and butter to stretch it out. Dust with more Old Bay Seasoning, reduce heat and simmer on low. I prefer to add Italian Seasoning at this point - just enough to powder the top of the sauce and stir. Some people may not want any seasonings in their sauce, so you may prefer to keep some to the side for those who wish to garnish their own, with either the Italian seasoning or parsley. At this stage, I prefer to melt the Parmesan cheese into the sauce as I do not keep leftovers. However, if you believe this dish will be too much for your family to manage in a sitting, you may want to add a sprinkle of the Parmesan cheese to the dish as it is served hot on the table. When the pasta is done, add to a plate and cover with the sauce. Garnish to taste. This is so tasty, that people will swear you stole it from a restaurant!